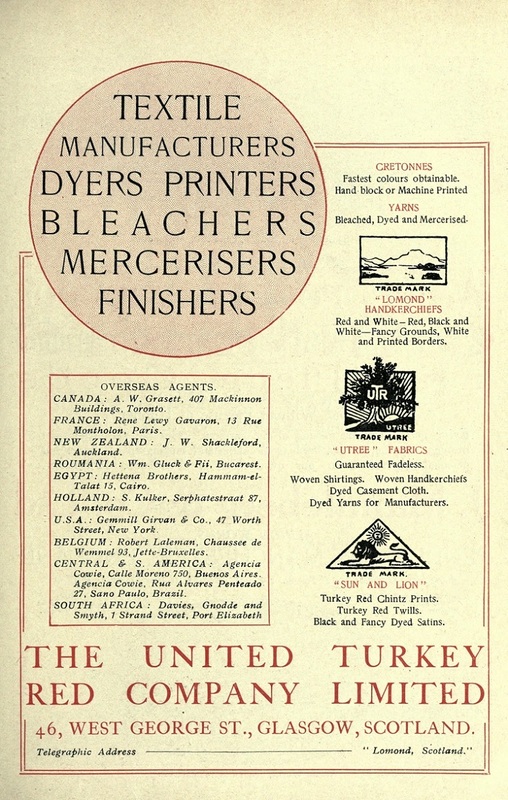 United Turkey Red Co Ltd, of Alexandria, Dumbarton, Scotland - dyers and calico printers. The company was established in 1898 and was the largest firm in the bleaching, finishing, dyeing and printing industry in Scotland. In 1960, its assets were purchased by the Calico Printers Association, and the Alexandria Works closed. 1898 United Turkey Red Co was incorporated through the amalgamation of the Dunbartonshire Turkey-red dyeing firms of John Orr Ewing and Co founded at Alexandria in 1834; Archibald Orr Ewing and Co founded at Levenfield in 1845; and William Stirling and Sons founded at Dalquhurn and Cordale in c1723. 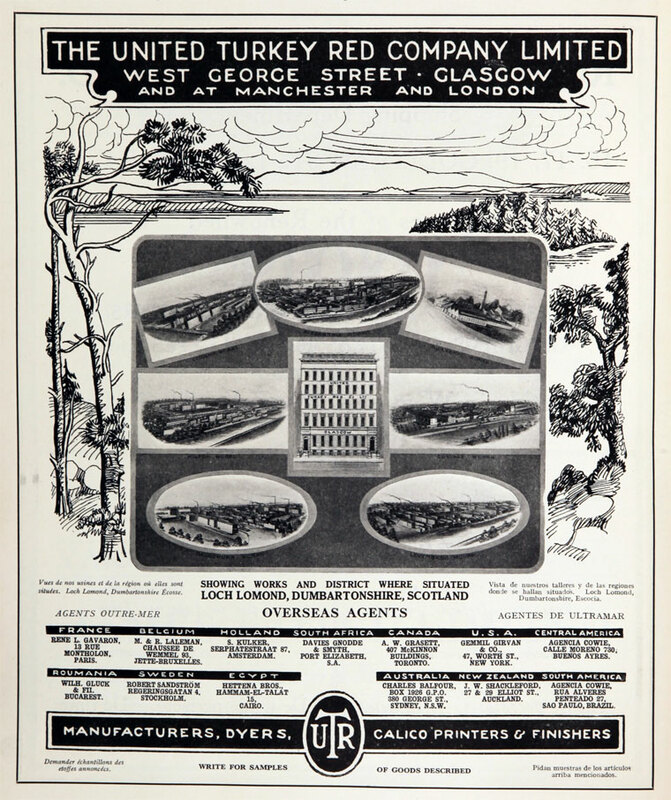 The company then acquired Alexander Reid and Sons of Milngavie, east Dunbartonshire, in 1900. The new company had a share capital of £1,500,000. This amalgamation had been brought about due to a number of difficulties within the Turkey-red dyeing industry in the West of Scotland. The 1880s had seen a German technical monopoly in the production of artificial alizarine which produced the Turkey-red colour and led to steep price increases for English and Scottish dyers. The refusal of Scottish firms to meet the price demands of their German suppliers led to a depression in the industry and mass unemployment. 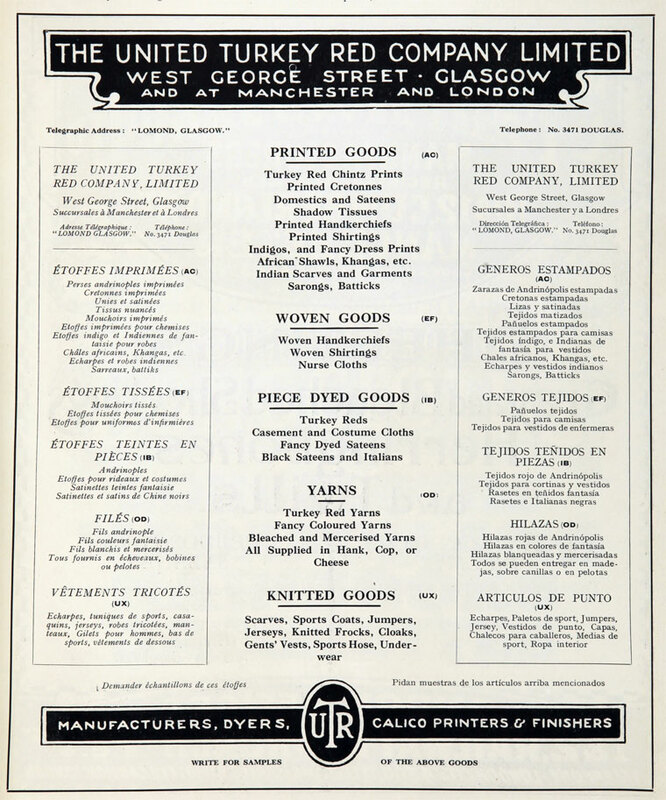 In the 1890s, the dyers set up a protective association, the Dyers in Glasgow and the West of Scotland, to contest what were seen as discriminative tariffs imposed on British dyed yarns imported into India. The first chairman of United Turkey Red Co was John Hyde Christie (1836-1926). Christie had been employed as chief chemist at John Orr Ewing and Co in 1859, becoming general manager and then a partner in the firm in 1878. It was Christie who had seen the amalgamation of the various Turkey-red dyeing concerns in the West of Scotland as the way to prevent the industries continued decline. The management of the new company maintained the commercial autonomy of individual firms for a while but eventually the business was reorganised under the overall supervision of John Christie, on a departmental basis. However, each company's name and branding was retained to maintain brand loyalty with the foreign markets. Three of Christie’s sons came into the business, and one of them, Henry Christie, became chairman following the death of William Ewing Gilmour, his father’s successor, in 1924. Together with James Morton (1867-1943), Henry’s brother, John Christie jnr, was responsible, during the 1900s, for developing a new, cheaper and quicker turkey-red dyeing process. They also worked on processes to produce other artificial dyestuffs but the board of the company was not keen to diversify at that stage. 1920, the company underwent significant reconstruction and rationalisation and the share capital was increased to £2,000,000, but this was soon followed by a slump in the over-confident market. John Christie left the company during a period of decline and labour unrest, partly caused by the formation of the United Turkey Red Co which had done away with the paternalistic relationship between the employee and employer. At this time, the head office of the company was at 46 West George Street, Glasgow and there was also an office in Manchester. Henry Brock, previously senior partner in John Orr Ewing and Co, continued at United Turkey Red Co as commercial manager until 1915, when, following his death, his place was filled by John McMurray, an expert in trade marks. He was responsible for supervising and expanding the firm’s export business, mainly to India. Christie’s three sons, Henry, John F. and George, all became directors with Henry becoming chairman in 1924. He travelled widely on behalf of the company and was responsible for introducing the production of hosiery at the Dalquhurn works. His brother, John Christie jnr, inherited his father’s chemical genius and was responsible for introducing a cheaper and quicker Turkey-red dyeing process to the company as well as other artificial dyestuffs. However, the company failed to encourage or exploit the diversification promised in the work of John Christie jnr. This reflected the more general malaise which saw the eventual decline of United Turkey Red Co in the face of widespread use of new Napthol Red dyes, which had been tested but rejected as unsuitable by the company as early as 1914. The Christie family maintained its connection with the company into the third generation, George Christie becoming a director. He retired from the company before 1960. 1960, the chairman of the company was H. Cowan-Douglas, and the managing Director was W. Calderhead. At that date, the registered office of United Turkey Red Co Ltd was Levenfield, Alexandria, West Dunbartonshire and there were company offices at 10 Charlotte Street, Manchester, and at 137-141 Regent Street, London. 1960, however, the company’s assets were purchased by the Calico Printers Association, Manchester, which closed the Alexandria works. The company name of United Turkey Red Co was retained, but as a dormant company, and was still in existence in 2003. Calico Printers’ Association Ltd, subsequently The Calico Printers’ Association, became English Calico Ltd in 1968 and then Tootal Ltd in 1973. This became a public limited company in 1982 as Tootal Group plc in 1982 and in 1989 under went a merger becoming part of Coats Viyella plc, a successor company of J. and P. Coats, cotton thread manufacturers, Paisley, Scotland. This page was last edited on 10 January 2018, at 11:26.